I decided to lay claim to hosting Thanksgiving the year I was pregnant with Isabella. No one was up to cooking, let alone cleaning up the aftermath from feeding a dozen people, and someone suggested we go out for dinner. I almost cried. 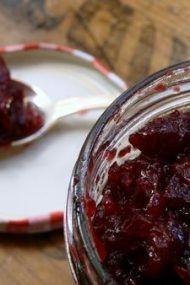 When I told Michael I wanted to host, he looked at me, and reminded me of the headache it would be, not the actual cooking, nor the cleaning—it was knowing that my family, the people whom I love dearly, would wonder, most likely even moan about why we had replaced the canned cranberry sauce and Stove Top stuffing with homemade recipes. Let’s not even discuss the spoonbread I made in place of mashed potatoes (I admit I pushed the envelope too much there…). These are all the thoughts that went through my mind as I tackled putting one of his beloved recipes to pen and paper for a project with Moink. 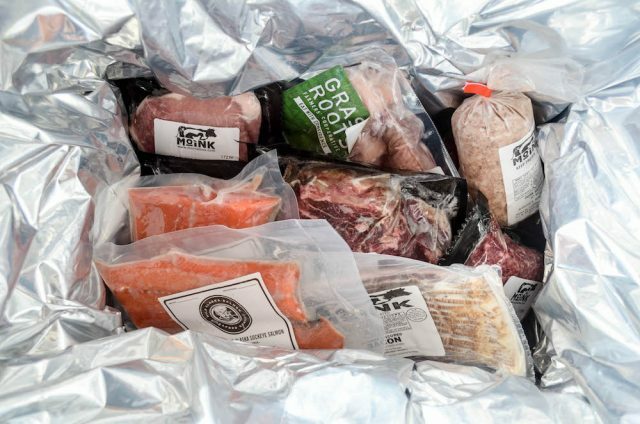 It seems a little odd at first to think a work partnership with a meat delivery service would stir such memories and emotions, especially as my diet has become less meat-centric, but as I contemplated the project, the story began to write itself. First, a little bit about Moink, and why I decided to work with them. 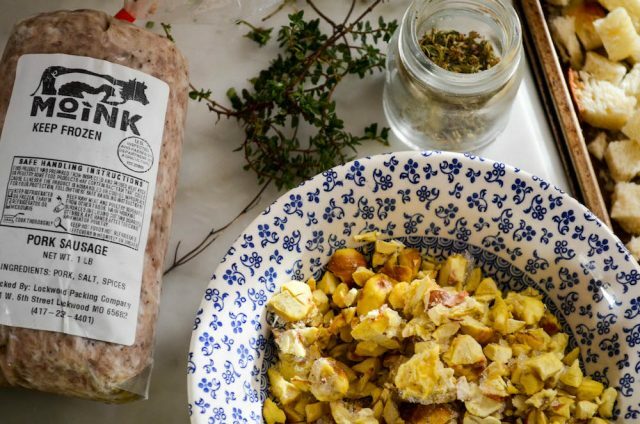 Moink is owned and operated by family farmers who want to make humanely-raised, ethically-sourced meat available to everyone. They offer four, fully customizable box options, and shipping is always free. What set their service apart for me was the flexibility in choice, wide range of products available (they offer salmon, too), the fact that you can choose to have a delivery shipped every four, six, or eight weeks, and most importantly quality—all of their meat is free of antibiotics, growth hormones, sugar, genetically modified grains, nitrates, artificial colors & solutions. The average box provides 13 to 16 pounds of meat, plus a bonus free whole chicken if you sign up before November 30th. While it’s a substantial amount, when broken down into a delivery every eight weeks, it comes out to about 9 ounces of meat per person, per week for my family of three, an amount that fits in with the role meat plays on our plates. Now that you know some more details about Moink, let’s get back to how the puzzle pieces fell into place. In reviewing their choices when putting my delivery together, I noticed ground breakfast sausage was available. 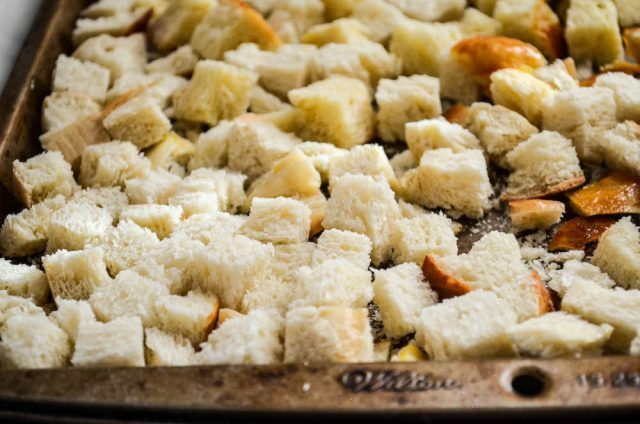 Perhaps it’s because of the impending Thanksgiving holiday, but I immediately thought about the stuffing Mikey used to make every year. 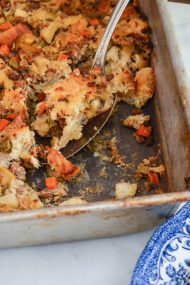 Originally called Rick’s Kitchen Sink stuffing, it had more ingredients than I ever thought belonged in a stuffing recipe. Actually, until that day back in 1995, I’d never even eaten stuffing. It wasn’t something my family made from scratch as I mentioned earlier. Instead, it came from a box of Stove Top (we also ate baked ziti as a first course before turkey, so clearly, we had some crazy things happening at our holiday table). Stuffing held no appeal for me—the polar opposite way Michael felt about his stuffing. His favorite part was eating it cold from the fridge, something that still makes me feel queasy just thinking about it! 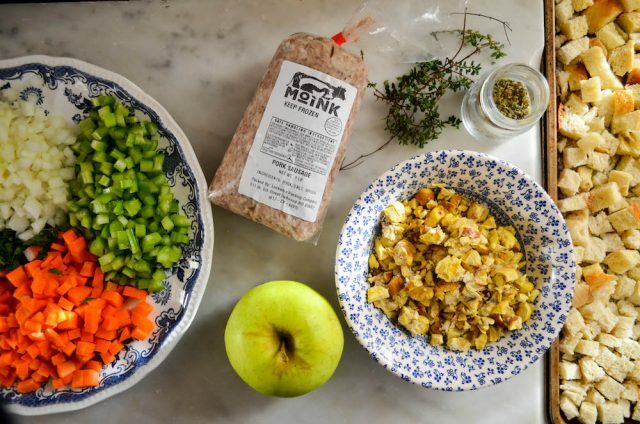 As the title might suggest, his stuffing recipe had a lot going on—pork sausage, carrots, onions, celery, chestnuts, apples, parsley, and dried herbs. As years passed, his stuffing evolved over time. I always urged him to add mushrooms. Some years he’d appease me, but more often I lost that battle. In fact, I meant to add them to this version I’m sharing today, even bought them, and then forgot to pull them from the fridge, so I took it as yet another sign that he would have final say, even in death, over whether or not mushrooms belonged in his stuffing. He did learn after some convincing that finely chopping the vegetables made for a more harmonious stuffing experience, providing a little bite of everything in each forkful. We also began adding egg as a binder to hold it together, an ingredient and tip that wasn’t in the original recipe. There are two things extra meaningful about the stuffing this year. I decided to swap out white country bread for my homemade challah, and there was no need to buy chestnuts from the market since I had collected some from my backyard earlier in the fall. I often find myself in the yard, sitting on the bench swing, wondering what he would think of our life today. Sometimes it’s all bittersweet because I’m not sure living in a rural area would’ve ever been a possibility for him, his job so connected to New York City. He never wanted to leave Brooklyn because he didn’t want to be tied to a train schedule, and miss out on time with his family due to the long commute. In a way, this life is only possible because a simple, painful twist of fate put us all on a different path. I’ll be cooking this stuffing along with mashed potatoes and gravy to deliver to the community center in Woodstock next week before the girls and I settle in for a cozy Thanksgiving dinner at home, knowing that even though it’s been seven years since we celebrated together, a little part of him, and the love we shared is nourishing those who need it most. Disclosure: Compensation for this post was provided for by Moink. All opinions expressed are my own. 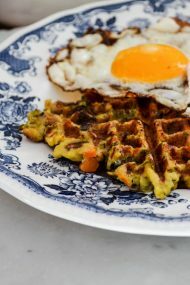 Thanks for supporting brands that value and support the work I do here at In Jennie’s Kitchen. NOTE: If storing in the fridge overnight, you can put the cold pan directly into the oven, but be sure to use a metal pan NOT a glass casserole, or it’ll break due to the sudden temperature change in the oven. Add a swirl of olive oil to a deep skillet. Heat over medium-high flame until shimmering. 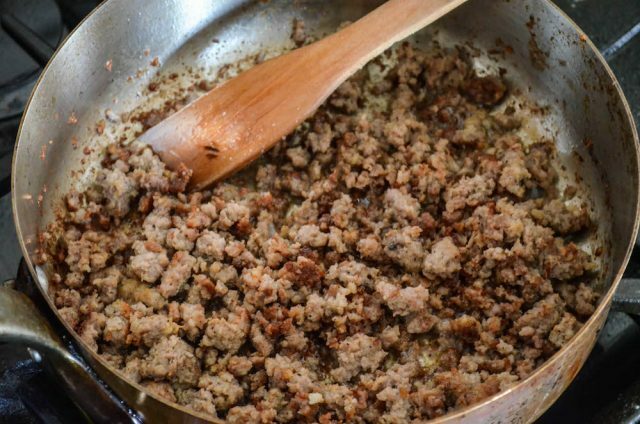 Add the ground sausage, and cook, stirring occasionally to break up any large pieces of meat, until browned all over. Spoon the sausage into a bowl, and set aside. Reduce the flame to medium. Add another swirl of oil to the pan if it seems dry. 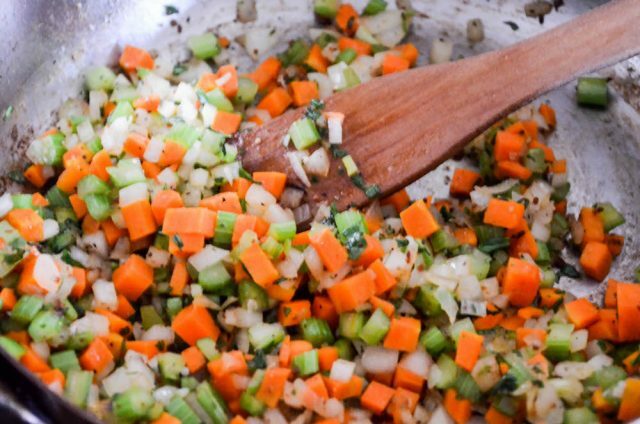 Add the onions, celery, and carrots to the pan. Season with salt and pepper. Sauté until slightly softened, and onions are golden, 3 to 4 minutes. Pour in the wine, using a spoon to scrape up any browned bits in the pan. Cook for 1 minute. Add the apple and chestnuts. 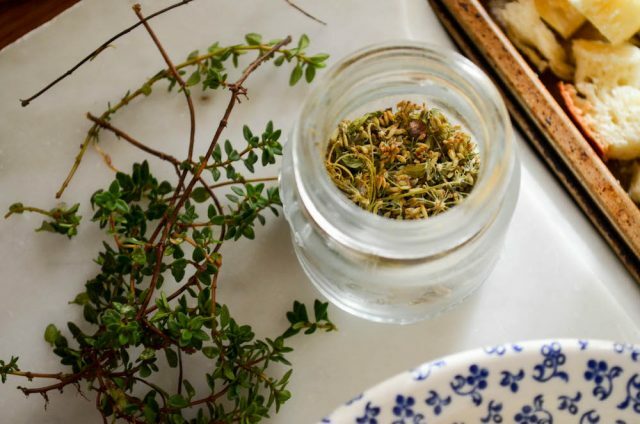 Stir in the lemon thyme and fennel. Cook for 1 to 2 minutes, until apple is slightly softened & fragrant. Remove from burner, and set aside while you pull the rest of the stuffing together. Add the eggs and broth to a deep bowl. Beat lightly to mix. Add the bread cubes, and the sausage, onions, celery, carrots, apples & chestnut mixture. Stir until bread is fully coated, and liquid has been mostly absorbed. Grease the bottom and sides of a 9-inch by 13-inch (22-cm by 33-cm) deep roasting pan. Spoon the stuffing into the pan, patting it down into place. Cover tightly with foil. At this point you can set in the fridge overnight before baking. It’ll give the bread time to absorb the flavors, but if pressed for time, you can go straight to the next step (see Note). Bake 30 minutes. Remove the foil, and bake for 30 to 40 minutes more, until the stuffing is deeply golden. Serve hot. That looks like a really good stuffing!!! I’m a little bit of a purist and don’t go for things like cornbread or oysters in mine. You might consider adding a note about chestnuts: one kind isn’t edible so readers with chestnut trees should make sure they have the right kind! Moink sounds amazing. I’m going to check it out! 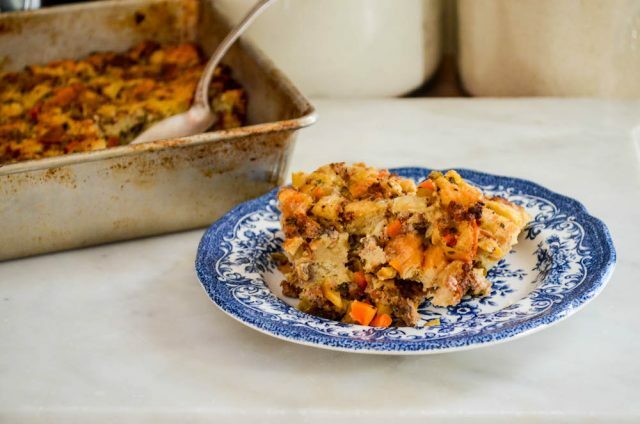 And I am sort of ashamed to say that I prefer Stovetop to any of the homemade stuffings I’ve been exposed to in my lifetime (which is not saying much since I am not a stuffing fan in general). 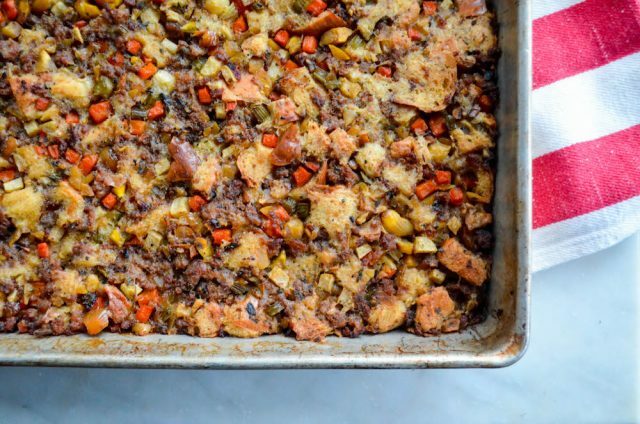 I grew up with my Italian grandma’s stuffing which was super cloying and heavy on the sausage. It was almost pasty. Never was a fan. My mother-in-law makes a similar stuffing these days with the sausage in a tube. Again, my husband loves it but I usually don’t even have a bite. My long gone mom used to make Stovetop, so maybe there’s a nostalgia factor there. I never buy it and never make it. But I’ll never forget it either! Happy Thanksgiving to you and your beautiful girls!